Everyone seems to love Caesar Salad but new twists on the old favorite are always welcome, especially when it’s as delicious as this recipe! A friend served this at a luncheon and all the guests gobbled it up, so that spurred me to convert it into a vegan version. 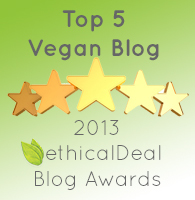 This was very simply done, as most of the ingredients were already plant-based and the others were swappable. As for the typical anchovies found in caesar salad dressing, I was never an anchovy fan in my pre-vegan days, so I didn’t even look for a substitute for that. 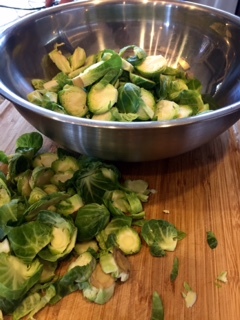 Brussels sprouts do not seem, upon first thought, to be the ideal basis for a caesar salad, I admit—but, as it turns out, they are perfect! You’ll have to try it and see—I wouldn’t steer you wrong! And you get massive health benefits from these little mini-cabbages! Even if you’re not a Brussels sprouts lover, I urge you to take a chance on this recipe—it’s that good. When the spouts are sautéed, a lovely charred and a kind of caramelized flavor emerges and it’s a beautiful complement to the salad dressing. 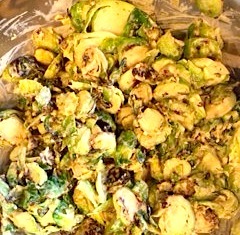 Brussels Sprouts Caesar Salad is great crowd pleaser and tastes just as good, perhaps even better, the next day. Serve it warm right out of the pan or at room temperature or cold from the fridge. It’s really good every way–we had it at all 3 temperatures! Halve the recipe if you aren’t serving this to a large group. This tasty recipe is wonderful as a side dish at your summer BBQ and can be made ahead! I really loved the dressing recipe for this and will use it in other salads—maybe a kale caesar!! Makes enough for 8 portions and you may have leftovers, which taste even better the next day! For a smaller party, halve the recipe. 1. 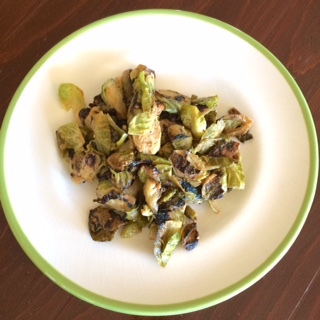 Trim the Brussels sprouts and slice thinly. Each sprout should be sliced into 3 or 4 pieces. Use any leaves that fall off too. 2. Heat an extra large frying pan or dutch oven type pot on medium heat. When warm, add the olive oil and put in the sprouts. 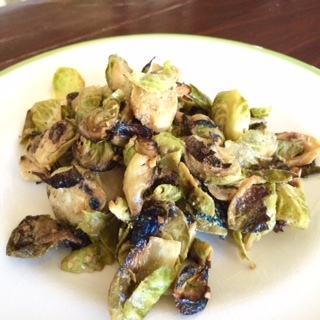 If necessary, you can heat up the brussels sprouts in 2 batches. Cook, stirring occasionally, for 7 to 9 minutes. They should be slightly seared in areas and just cooked in other areas. 3. 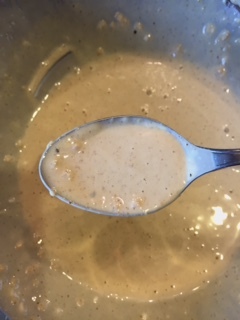 Meanwhile in a medium bowl, whisk the vegan mayo, the mustard, the soy sauce, lemon juice, garlic, nutritional yeast and hot sauce. 4. 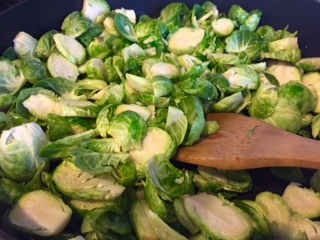 When Brussels sprouts are finished cooking, lower the heat and add the dressing into the pot, tossing it in. Season with alt and pepper. 5. Serve with an extra sprinkle of nutritional yeast. It can be served warm, at room temperature or cold from the fridge. Note: When I made this recently, one of my guests requested that I make a batch without mayo, which I gladly accommodated. We were able to compare the 2 batches and they were both delicious. The original non-vegan recipe called for a lot more mayo and I felt that it was too much for my taste. This recipe is a compromise but no mayo at all will work. High amounts of cruciferous vegetables, like Brussels sprouts, has been associated with a lower risk of cancer. The sulfur-containing compound, sulfuraphane, that gives the bitter taste gives them their cancer-fighting property. Improves bone health because the vitamin K improves calcium absorption, and also contains 38 mg of calcium in 1 cup. Contains alpha-lipoic acid that has been shown to lower glucose levels and prevent oxidative stress in people with diabetes. 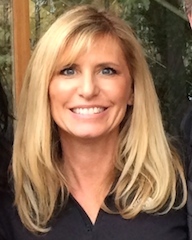 It also has been shown to decrease peripheral neuropathy in diabetics. The vitamin C keeps vision healthy by increasing protection agains UV light damage, decreasing the risk of macular degeneration. Vitamin C also helps fight skin damage, reduces wrinkles and helps in the formation of collagen. Important Health Warning: If you are taking a blood thinner, like Coumadin or Warfarin, you must be careful of consuming too much vitamin K which plays a large role in blood clotting.